Exxon Mobil is an American oil company. As of today, it is one of the world’s largest privately-held companies exploring and refining crude oil. The company headquarters in Irving, not far from Dallas, Texas, the U.S.
Exxon Mobil is a result of one of the largest mergers over the past decade. Today, the company explores crude oil worldwide including the United States, Canada, the Middle East etc. Filling stations of this company successfully operate in over one hundred countries. Exxon Mobil owns shares of 45 oil refining companies in 25 countries worldwide. ExxonMobil is listed on the New York Stock Exchange (NYSE) under the ticker XOM. A price of Exxon Mobil stock depends on the revenue made over the last fiscal period. The revenue has to be compared y-o-y because demand for the company’s products changes depending on a season. Being the largest privately-held crude oil explorer, Exxon Mobil directly depends on the global prices of black gold. The higher the price of crude oil is, the higher the revenue the company makes. This is why investors dealing with binary options on Exxon Mobil stock have to forecast not only future quotes of Exxon Mobil stock but also a price of a barrel that in its turn may affect Exxon Mobil stock quotes. 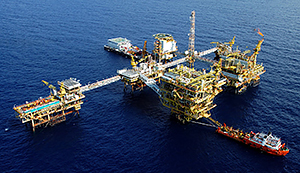 Prices of crude oil depend on exploration worldwide, demand for crude oil and its products. A balance between supply and demand plays the key role here. If the explored volumes considerably exceed demand, oil becomes cheaper, and a decrease in prices causes a decrease in revenue of oil exploring companies including Exxon Mobil. If demand grows and exploration remains at the same level or reduced, the market becomes undersupplied which makes the price of crude oil go up. In this case, Exxon Mobil stock quotes also rise. It’s important for the company to own as many oil deposits as possible that it can explore. If the company starts exploration of new oil deposits, this is apositive factor. If exploration turns to failure, the stock quotes plummet fast. Exploration of a new oil deposit causes Exxon Mobil stock to rise. Exxon Mobil stock quotes may be affected by the projections of the company or reputable analysts. Negative factors include natural disasters, military operations, accidents, oil spill news at oil exploration spots. Forecasting of Exxon Mobil stock quotes may be an interesting task because you need to analyze not just prices of the global crude oil, but to find correlation between the regions affected by Exxon Mobil. You can find financial results of the company, its management statements, plans and strategies, reports on expected earnings influencing investors’ sentiment and other official figures of the company on Exxon Mobil’s official website, in the investor section. If you are going to buy Exxon Mobil stock, you need to know that this purchase requires large capital, some time and may return just 10% to 15% per annum. 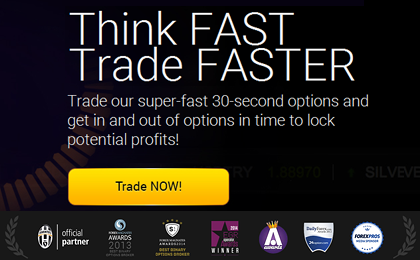 However, if you buy a binary option, you can get a higher return much faster. 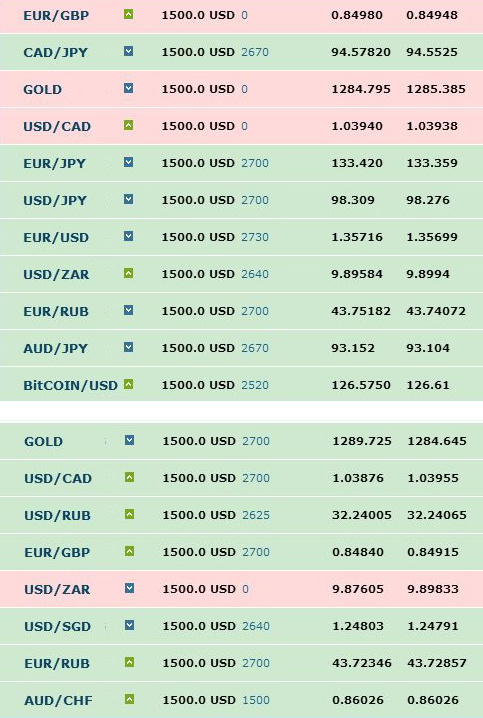 To earn on a binary option, you need to pinpoint whether Exxon Mobil stock will rise or fall in a certain period of time, say, next 20 minutes. 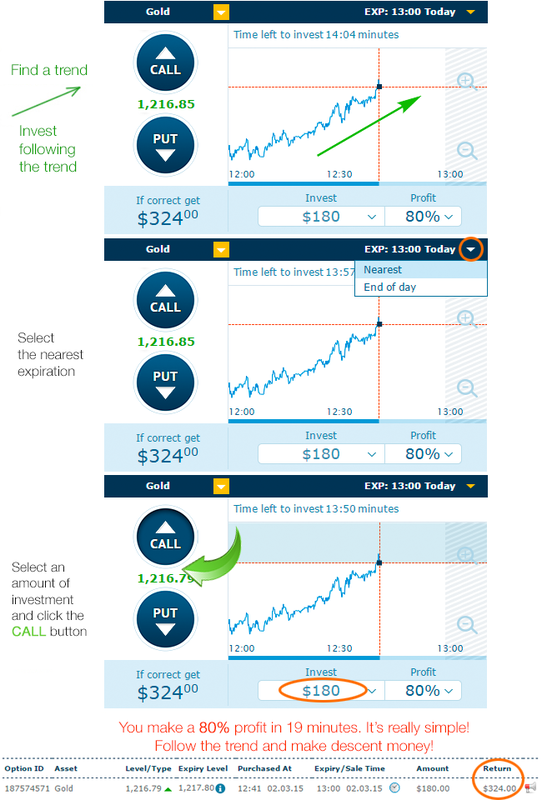 The top binary option broker AnyOption offers binary options on Exxon Mobil stock. 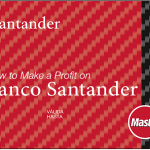 AnyOption is licensed by the EU institutions, CySec, CONSOB, FCA etc. 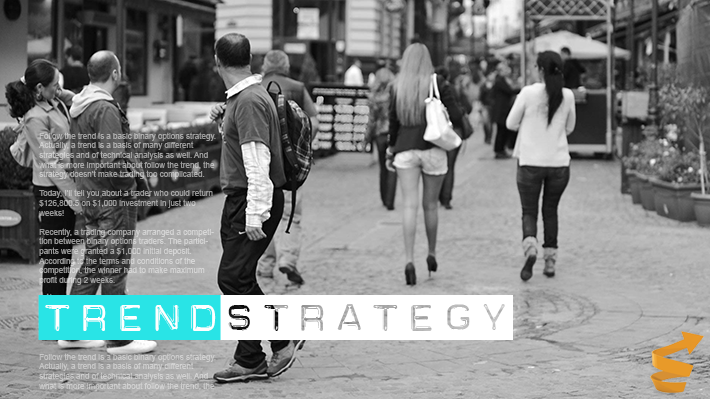 The broker has a wide choice of underlying assets. It was 7:11 p.m. at that moment, and the option had to expire at 7:30 p.m. which meant that I invested in the option for a period of 19 minutes. 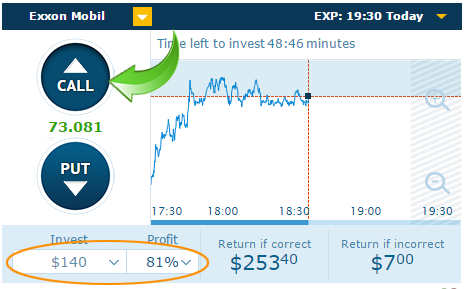 If Exxon Mobil stock rose even by a pip in 19 minutes, I would make an 81% profit. 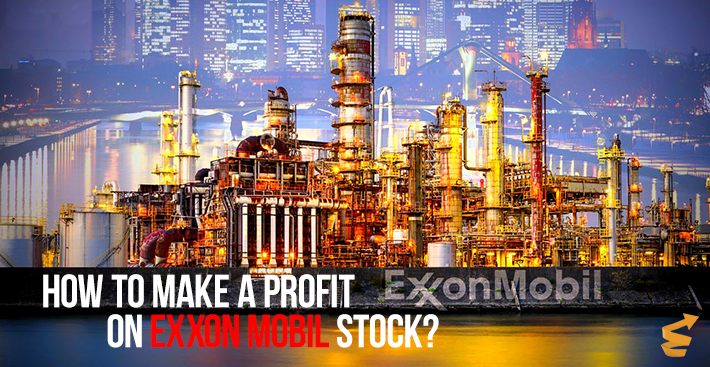 Any of you can make a profit on Exxon Mobil stock! It takes only a minute to sign up, and you get wider opportunities for years ahead.